We are happy to announce that Azure Site Recovery (ASR) now provides you the ability to setup Disaster Recovery (DR) for IaaS VMs using managed disks. With this feature, ASR fulfills an important requirement to become an all-encompassing DR solution for all of your production applications hosted on laaS VMs in Azure, including applications hosted on VMs with managed disks. Managed disks provide several advantages including simplification of storage management and guaranteeing industry-leading durability and availability for disk storage. 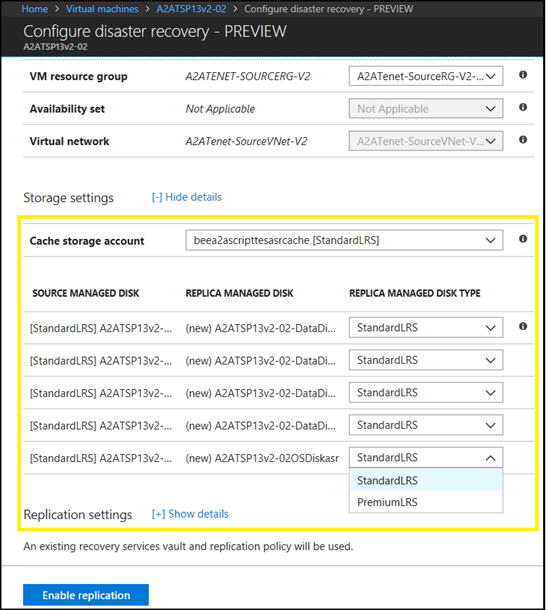 When you protect virtual machines on managed disks, Azure Site Recovery creates a replica managed disk in the target region corresponding to each managed disk of your production VM in the primary region. This replica disk acts as the data store for the source disk in the primary region, thus eliminating the need to create and manage multiple storage accounts in the target region to store data for your protected machines. You can enable protection for the Virtual machine via the virtual machine experience or through the recovery services vault experience. If you intend to convert virtual machines on unmanaged disks currently protected using Azure Site Recovery to virtual machines on managed disks, disable protection for these virtual machines, convert them to virtual machines with managed disks and then protect them back. Converting virtual machines using unmanaged disks to virtual machines using managed disks while they are protected is not supported. You can also choose to specify the type of replica managed disk as standard or premium, depending on your performance requirements. While setting up protection, a cache storage account is created per recovery services vault in the source region and re-used across your protected VMs. This cache storage account stores any data changes on your protected machines temporarily, until our service transfers it to the secondary region. One cache storage account is sufficient to handle the data changes for multiple protected VMs. However, we also provide you the ability to customize and specify the cache storage account per VM. This feature is deployed in all Azure production regions where ASR is supported. We will be rolling out this capability to national clouds soon.